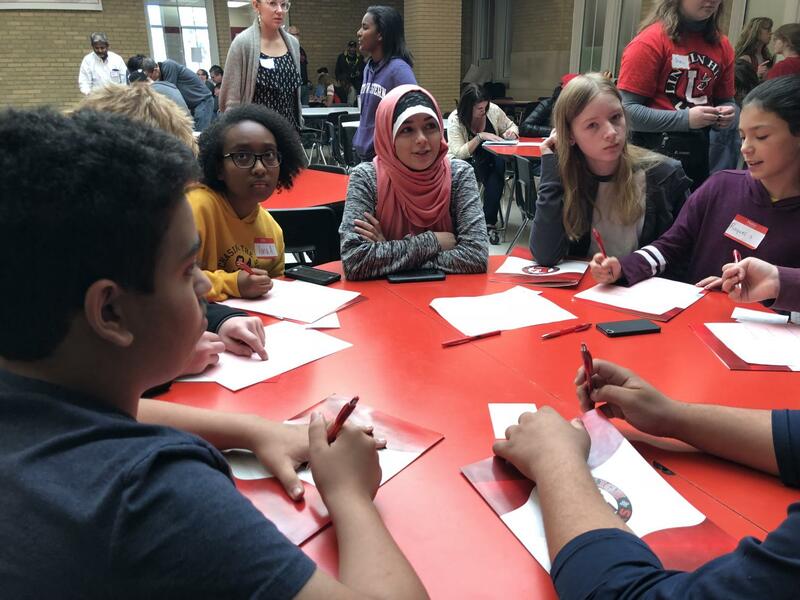 Possible future Pre-IB students gather at tables in the cafeteria in Lincoln High at IB Academy Day on October 27th, 2018. Advocate staff photo. 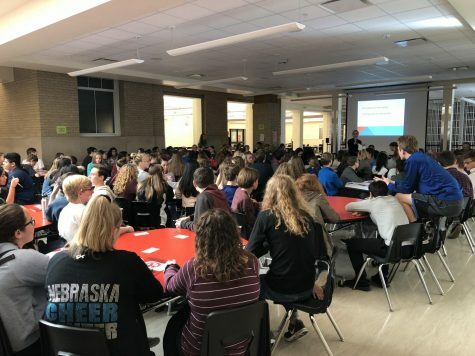 A couple of weeks ago on Saturday, October 27, 2018, students from all around the LPS school district congregated at Lincoln High to hear and learn more about the International Baccalaureate (IB) Program which Lincoln High hosts. “The IB offers an education for students from age 3 to 19, comprising of four programmes that focus on teaching students to think critically and independently, and how to inquire with care and logic,” according to the official International Baccalaureate website. This rigor is a big part of why the IB Program is so popular within students of the high school age. Possible incoming Pre-IB students fill the tables in the cafeteria in Lincoln High at IB Academy Day on October 27th, 2018. Advocate staff photo. To allow incoming students to get an idea of what day-to-day classes look like for someone who’s a part of the IB program, IB Academy Day was held within the school from 8:00 a.m. – 12:00 p.m. However, IB Academy Day isn’t all about the IB Program. This day also teaches possible incoming-students to LHS about the culture and the people within these walls. Many teachers from different parts of the IB and Pre-IB program were part of the happenings on this day. 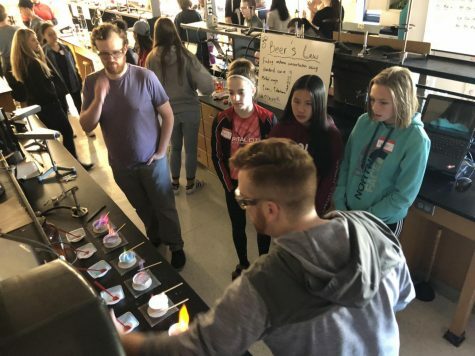 Lincoln High alum and IB students perform a science experiment to students at IB Academy Day on October 27th, 2018. Advocate staff photo. The IB Program is filled with much mystery and many questions for much of the incoming students involved, as it is a much different school experience to anything they’ve had before. 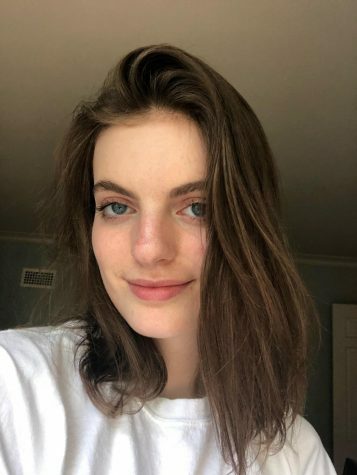 “I think IB is great for many academic pursuits and opportunities, I think high school will drive me mad, and I think that Academy Day was the cause of my calm yet the culprit of my worries. All in all, I can’t wait [for high school],” Gomez said. 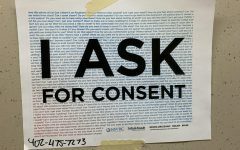 I just stumbled on this great article. I really like the focus on the students who participated in the event. The writing, along with the pictures, really conveys what the day was all about. I’m especially happy because I helped to organize the event. Thanks!